Nigel Short: "Carlsen Will Still Win but I Think It Will Be a Much More Exciting Contest"
GM Nigel Short assessed Anand's win as "an incredible comeback". "He played very well and thoroughly deserved his victory," The Times of India quotes Englishman. "I think he will do a lot better in the rematch. I'm not going to say he will win but I think he will play more aggressively and in a less constrained manner. He looked like somebody who was afraid of losing the world title but now that he has lost it, I think his chess will have aggressive freedom. Maybe the world title was too heavy a burden on him. Probably he was suffering from fear of defeat for a long time and this has been constraining his chess. Instead of trying to win, he was trying to hold on to what he has. That is normally a dangerous thing to do. I think it will be a closer match. 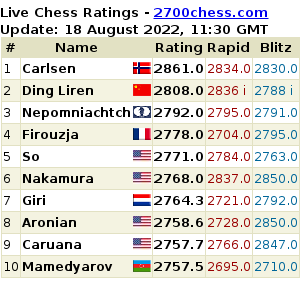 I will say Carlsen will still win but I think it will be a much more exciting contest." The Danish GM Peter Heine Nielsen won't be helping neither Vishy Anand, nor Magnus Carlsen in the upcoming World Championship Match. This was announced by the reigning World Champion Vishy Anand in the interview given to The Times of India. The Times of India reports that the strongest Indian player Humpy Koneru won't play got the national team at the upcoming Olympiad which will be held in Turkey. Her father and coach Ashok said: "Humpy would not like to talk anything about the Olympiad." Nigel Short: "I Understood That Kasparov Was Very Vulnerable"
Grandmaster Nigel Short, who played in October a nostalgic blitz match in Leuven, Belgium against Garry Kasparov, and lost this competition by a narrow margin, 3.5-4.5, answered a couple of Mikhail Golubev’s questions for our website. M.GOLUBEV: How would you evaluate the match and your result? 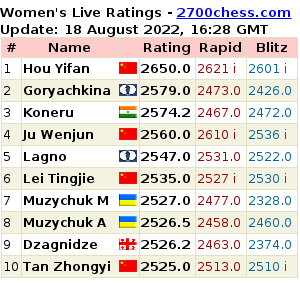 The pairings for the round-robin London Chess Classic which starts from Saturday 3rd December had been announced. The players drew following numbers: 1. Nigel Short 2. Vladimir Kramnik 3. Levon Aronian 4. Magnus Carlsen 5. Michael Adams 6. Viswanathan Anand 7. David Howel l8. Luke McShane 9. Hikaru Nakamura. Garry Kasparov: "I'm Rooting For a Carlsen Victory Because a New Generation Deserves a New Champion"
Espen Agdestein: "How This Match Goes Doesn’t Really Matter For Brand Carlsen At All"
Magnus Carlsen's manager Espen Agdestein is already in Chennai and answered on the questions of Livemint.com. Nigel Short, "People Who Love the Game Were Disappointed"
A friendly match between GM Nigel Short and the strongest Iranian player GM Ehsan Ghaem Maghami is taking place in Tehran.